Can England hold on to scrap a draw? Can the Tourists even get the win? No of course they can't. It's goijg to be 3-0 Australia and the regaining of the Ashes. We've added two specific Day 5 tips to our Ashes Test 3 tips. We review the best live Ashes odds and best tips, ready for start of play on 17th December at 10:30am local time. Australia are battering a frankly hapless England side, and look to be absolutely oozing with talent as they wipe England like a....... Our tips therefore remain firm, as Australia declared before the start of play, to give themselves two full days to bowl the hapless Poms out. With England posting their highest score of the series so far to close on 247-6, only the weather can thwart the Aussies on Day 5. We review the best live Ashes odds and best tips, ready for start of play on 9th December at 10:30am local time. England took another hammering on Day 3, so our tip of backing Australia for the First Test at odds of $2.90 at the end of Day 1 looks to be even more secure than it was at the end of Day 2! The tourists will do well to bat out the 4th day, so we also advise backing England Under 287.5 2nd Innings at odds of $1.90. We review the best live Ashes odds and best tips, ready for start of play on 24th November at 10am local time. This is the 68th Ashes series and probably one of the closest in history. England marginally edge Australia in the outright betting, but with the home advantage being with Australians, this could go either way. The first test starts Thursday, and we suggest Australia at $2.60 to get off to a strong start and put England under pressure right from the start. England are $2.38 slight favourites for the first Ashes test match against Australia, however we think the Aussies will win, and win with relative ease. 2013/14 Ashes odds: Who will be the Top England Runscoring Batsman? Captain Alastair Cook is the $3.75 favourite, with Kevin Pietersen and Ian Bell following in the betting. 2013/14 Ashes odds: Who will be the Top Australia Batsman? Shane Watson and Michael Clarke are joint favourites at $4.00 very closely followed by Chris Rogers at $5.00. 2013/14 Ashes odds: Who will be the Top Australia Bowler? Ryan Harris will be the favourite, followed by Peter Siddle and Mitchell Johnson. 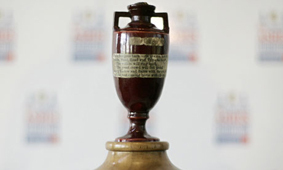 2013/14 Ashes odds: Who will be the Top England Bowler? James Anderson is the $3.00 favourite followed by Graeme Swann and Stuart Broad. 2014 Ashes odds and betting. Australia v England latest bets, series winner, top batsmen, top bowler, all the latest live odds on the Ashes. The Ashes 2103 England Vs Australia, top run scorers, top wicket takers and other great odds and betting tips.